Dr. Romeo del Rosario, a missionary for the General Board of Global Ministries, is visiting local churches in the Louisiana Annual Conference from Dec. 9-15, speaking about our shared ministry in Cambodia. Dr. Rosario serves as country director of the United Methodist Mission in Cambodia. On Dec. 10, Dr. Rosario met with church pastors and Louisiana Volunteers in Mission volunteers to Cambodia during the noon hour at First United Methodist Church in Baton Rouge. 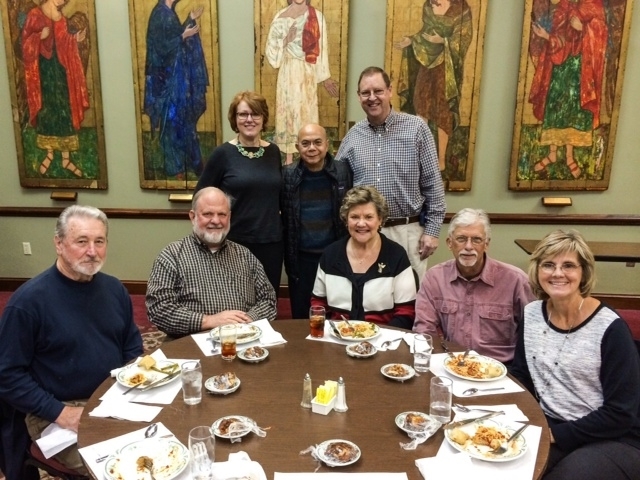 Pictured above at the gathering were, standing, Dr. Rosario with Chuck Reynolds, a member of St. Timothy on the Northshore UMC in Mandeville and Cambodian Mission coordinator for the Louisiana Conference. Seated, left to right, were Susan Reynolds (St. Timothy UMC), Judy Foust (Cambodian Mission Coordinator for First UMC, Baton Rouge), Todd Rossnagel (First UMC, Baton Rouge) and Dutch Price (First UMC, Plaquemine; Grand River UMC). Also attending the luncheon were, standing, Rev. Juliet Spencer (St. Andrew's UMC, Baton Rouge), Dr. Rosario, Reynolds, and seated, Jimmy Spencer, Ken Musick, Celia Musick, David Howell and Jeanie Howell, all from St. Andrew's UMC. St. Timothy UMC hosted several opportunities yesterday to hear Dr. Rosario; he will also be the guest of honor at dinner this evening at Trey Yuen restaurant in Mandeville. For more information, please contact Charles Reynolds at csrey67@bellsouth.net. Find out more about Louisiana Volunteers in Mission and our efforts in Cambodia here.